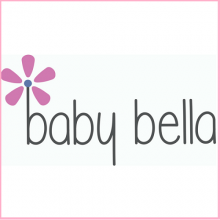 Peppa Pig: My First Cinema Experience COMPETITION! 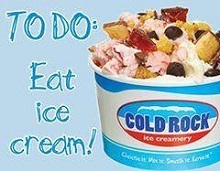 SUNDAY 12 MARCH – 11:00am at BCC Coffs Harbour. To find out more click here. New stories, new adventures and new friends! Peppa Pig is splashing onto the big screen for the first time in Australia! Take part in one whole hour of fun, featuring all brand new episodes as well as exclusive new interactive content, where you can dance, sing and play along with Peppa, George and their new friend Daisy. 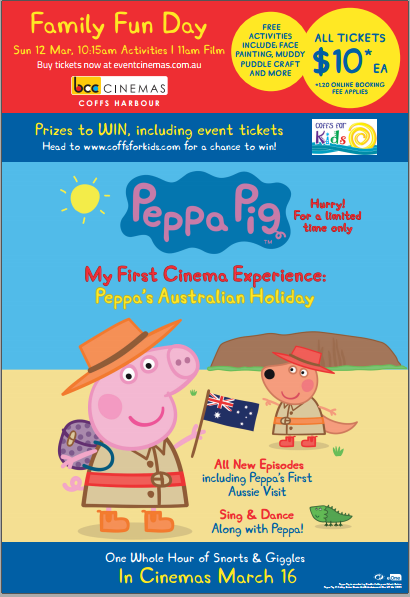 Join Peppa on her first Australian holiday as she visits her friend Kylie Kangaroo and family. On this exclusive four-part adventure, see Peppa visit the outback for a barbeque, learn to surf, throw a boomerang and see the Great Barrier Reef in a submarine! Watch out for special new appearances from Mr Wallaby, a platypus and a koala! Plus 5 other brand new episodes, including a trip to London, a day out at the Zoo, a cruise along a canal and some advice from Policeman Panda. This unique and exciting first cinema experience is perfect for pre-schoolers, so bring along your little ones for plenty of snorts, giggles and jumping up and down in muddy puddles! 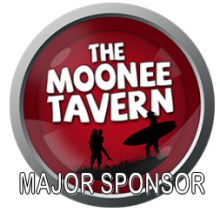 Thanks to BCC Coffs Harbour, we have some prizes to giveaway! 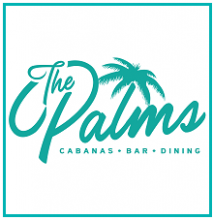 The winner will receive a special prize pack with double pass to the movie and popcorn + drink pack and we have 6 double passes for runners up prizes! To enter, just click the form below and fill out your details. 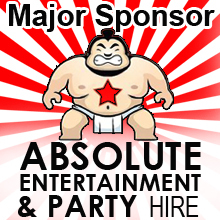 We will contact the winners via email and announce on Facebook 9pm Thursday 9th March. Prizes cannot be exchanged for cash or any other movie. 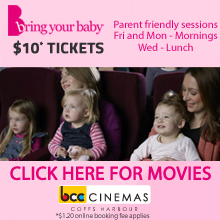 The tickets are valid for any screening to Peppa Pig My First Cinema Experience shown at BCC Coffs Harbour. Competition closes 9pm 9/3/2017 and winners will be notified by email and announced on Facebook. Winners will be chosen via random.org. 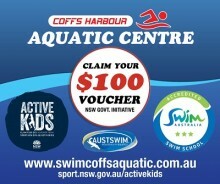 By entering you agree to be added to the monthly Coffs for Kids newsletter which you can unsubscribe from at any time. Félicie is a young orphan from Brittany with only one passion: dance. With her best friend Victor, who wants to become a great inventor, she devises a madcap plan to escape the orphanage for Paris, the City of Lights where the Eiffel Tower is still being built! 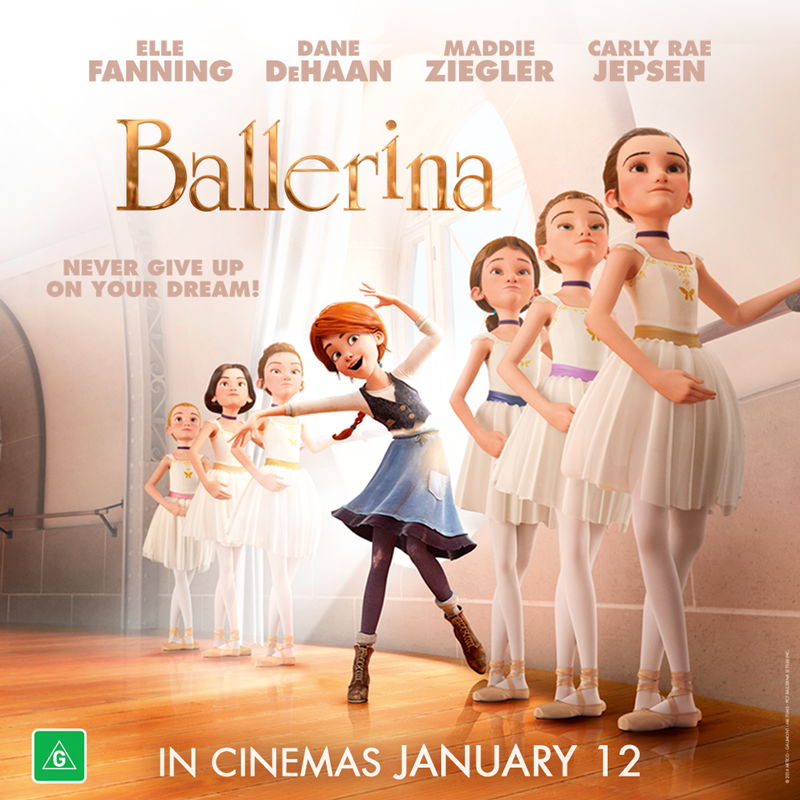 Félicie will have to fight like never before to surpass herself and to learn from her mistakes, to make her wildest dream come true: becoming a prima ballerina at the Paris Opera..
Coming to Birch, Carroll and Coyle Coffs Harbour on 12th January. We have a special competition – for your chance to win a prize pack as well as a double pass to the movie click here to enter via Facebook. 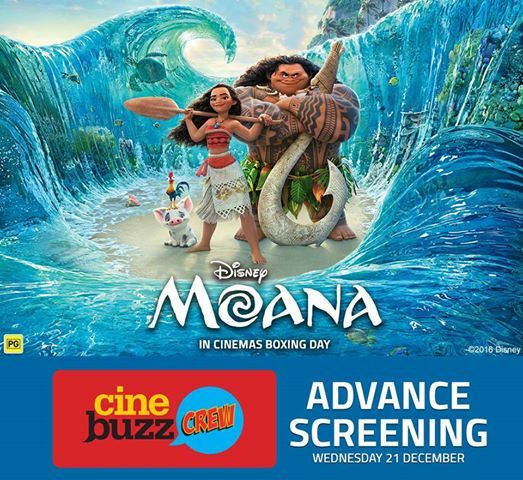 Get the family together for a night out before Christmas to the final Crew Screening for 2016 and splash into a special Advance Screenings of Moana! FREE family activities from 5.30pm, it’s the perfect start to the school holidays and a great night out to re-group before Christmas! 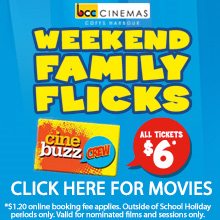 Enter our competition on Facebook to win tickets to the movie for a family of 4 as well a family combo (4 small drinks + 4 small popcorns). Competition! Win a signed copy of book written by local Mum. 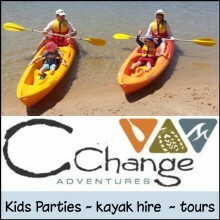 You can find out more about Shannon & the book by visiting her website – www.shannongarner.com.au and Facebook page. If you would like to win yourself a signed copy all you have to do is fill out this easy entry form. Two winners will be announced 24/9/16.